The Scarpa Vapor V is an all-round performance climbing shoe designed to break conventions and be a "performance shoe with instant comfort". Designed by Heinz Mariacher, the man behind many of La Sportiva's classics like the Katana, Miura, and Mythos, the Vapor V's focus on performance without the sacrifice of comfort is purpose-built for beginner climbers seeking an entry into the world of performance climbing shoes or the further advanced who require all-day comfort in a soft, technical shoe. 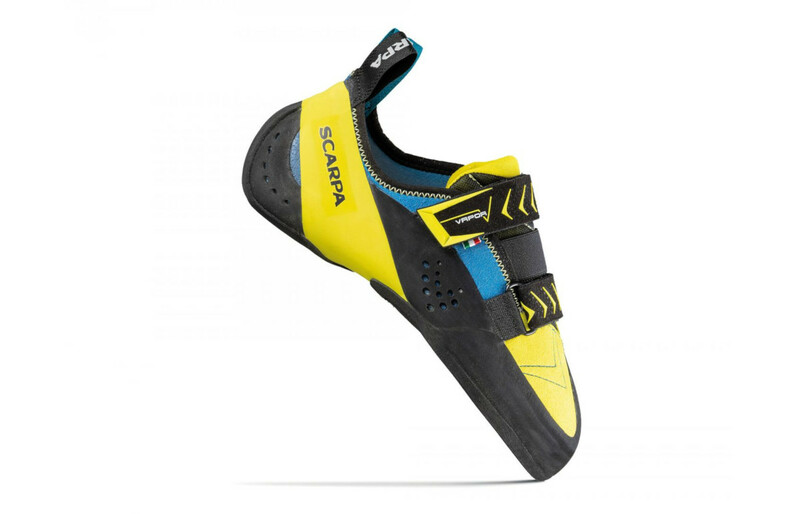 Scarpa have achieved this performance comfort in a few main ways. The Bi-Tension rand does the opposite of a slingshot rand: rather than painfully jam the toes forward, the rand connects beneath the toes and pulls backwards to the heel structure to decrease tension, providing the same amount of precision but with less toe pain. The inner is soft suede leather with an almost luxurious feel to it, and the tongue is perforated to enhance breathability. As for design, the Vapor V is on the technical side of performance all-rounders. Its soft midsole, toe rubber, and stepped heel cup provide performance on technical boulder problems and overhanging terrain, but the firm Vibram XS Edge rubber maintains stability on edges. The inner is lined suede leather, so expect it to stretch up to a half size. For a stiffer version that's better for longer routes and edging, try the lace version, the Vapor Lace. *New tongue construction which is lighter, more breathable and will also retain its shape and positioning. Rubber compound built for maximum performance on micro holds and extreme edging. This formula uses an improved plastic deformation resistance that ensures the utmost stability, rigidity, and support on footholds in hot or cold weather, as well as generally increasing durability. A rand that that pulls power from the toes to achieve performance with less tension and less painful toe cramming. The Bi-Tension Rand also reduces the amount of rubber needed under the toes, which means lower weight and higher sensitivity. This is my everyday climbing shoe - perfect for gym climbing and for climbing on all routes other than for redpoint burns. Fits my slightly wide foot shape. There's no break-in time required. Easy to put on and to take off. The downturn and asymmetric last is perfect for precision on tiny footholds. The only downside for me is that the heel feels slightly voluminous, but I don't generally heel-hook so it's not an issue. This is my third pair Vapor V.
Fits my wide feet perfectly. I use them as my every shoe for longer routes, bouldering and indoor climbing. They are comfy and edge well on granit with the edge rubber, I just wished I could get them with friction rubber as well. I wear these in size 43,5, compared to la sportiva 43, five ten 44 and street shoes 44-45. This particular model i size up .5 compared to the more aggressiv models from scarpa, I can then wear them for long time and they barely needs breaking in. If you want to upgrade to an intermediate shoe - here you go! 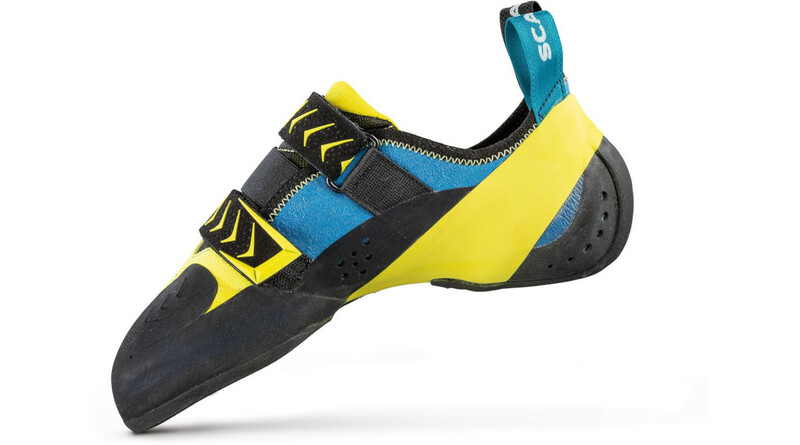 After several months of - regularly - indoor bouldering and finding out the limits of what I can do and can't with my Tarantulas, I've started looking for a pair of shoes which is more intermediate, which allows me to be more precise when it's about tiny footholds or working on my toe and heel hook technique. And I think the Vapor V is the perfect shoe for this intention. As I said I'm an intermediate climber (around 6b to 6b+ish) and since my first pair of climbing shoes weren't only comfortable but even loose fitting, I wanted my next pair to be as tied as possible without the necessity to take them off after each problem. I picked the Vapors in EU 40.5 (my normal shoe size is EU 42) and was kinda afraid that I made the wrong decision after the first couple of usages, since the shoes were cutting into my heel really badly. But after - let's say - 4 to 5 times of wearing them, they became more and more comfortable and customised to my feet without loosing the tight fit and their shape. I'm wearing them for two months now and I can keep them on for hours without any problems. As I proceeded with climbing, I've gained more and more confidence in general but especially in my feet, thanks to the Vibram sole (at least to a large extent), which stick to the wall like superglue (this is exaggerated, but you know what I mean). I know it's not all about shoes, but I did recognise a progress in my bouldering skills and I really think that the Vapor V's played a significant role in that. I have been using the Vapor V indoors and outdoors and I liked it so much that when it started being damaged I bought a new pair half a size smaller to only use it outside. It combines comfortability and precision. Moreover, it also has great durability. I had been climbing with a pair of beginner Climb-X shoes for a while and decided to get a pair of more intermediate shoes. Instantly i could notice the improvement they provided. The sole is more sensitive so it's easier to feel where I'm placing my feet instead of blindly placing them and hoping for the best. In addition the slight downturn allows me to keep my feet on the wall on steeper problems, whilst not being too aggressive to provide discomfort. The extra rubber on the toe and notches on the heel make heel hooking and toe hooking easier. Finally, although it's not really relevant to climbing, they are a very stylish looking pair of shoes. The only slight problem is that the shoes fart when establishing on the wall, though this doesn't bother me. I bought these in my usual street shoe size and they fit perfectly, nice and snug. Definitely worth the money if you're looking for a nice intermediate shoe that provides performance whilst not being too uncomfortable. These are very comfortable all-round shoes, they fit well straight out of the box and don't stretch much at all. A wide toe box adds to the comfort, but might sacrifice a tiny bit of sensitivity on smaller edges and smears. Slightly downturned, medium stiffness midsole, though they feel pretty flat when wearing them. This newer version of the Vapour V adds some rubber to the toes for better hooks and jams, and a little structure to the heel rubber, for better heel hooks. The 2 velcro straps allow you to really lock down. Climbed indoor and out, boulders, different rocks types, and they performed well especially considering their comfort. For more performance at a sacrifice of comfort, look for more aggressive shoes. Owned two pairs of the previous generation and armed with the knowledge that these were built on the same last, getting this newer version was a no-brainer. Great edging and fit for wider feet. I upgraded to these as a more technical pair of rocks boots and have instantly noticed an improvement in edging, allowing me to do far more technical climbs. They are also forgiving for wider feet as I have found it difficult to fit into other boots of the same size. replaced my old vapour v's with the new versions, still fit nice and tightly and seem to be a bit more aggressive as well. I've only been climbing 6 months and this is my second pair of shoes. I was looking for an all round shoe that made me feel like I could put all of the power through each part of my foot as my old shoes were slipping off smaller holds. They have been fantastic, they are like socks on my feet and I am standing on holds I couldn't dream of before. I have also used them outside where they have done really welll, although I have nothing to compare them to outside. Got these shoes last year and loved them so much that I got some more when the toe finally went. Mainly used indoors they stick to the wall better than any of my previous shoes. Seriously great on the Dartmoor granite too. Comfortable (for rock shoes) straight out of the box, so much so that I decided to go half a size smaller for a more solid heel hook. Still fine. I'd say look no further..